Like it or not, the end of summer has arrived and we’re quickly heading into fall. For some people, fall means cozy sweaters, hot chocolate, and lots of pumpkin carving. For others, it’s the gloomy end of long, warm summer days spent outside. No matter how you feel about fall, your lawn will need a little attention to help it prepare for the cooler temperatures. 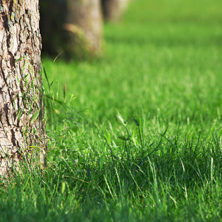 Some basic autumn lawn care can help your Grand Rapids grass come back looking better than ever in the spring. Do a general cleanup of your yard. Summer can take its toll on your lawn, so take a moment to do a little cleanup work. Pick up summer toys that won’t be needed in the winter, cover up lawn furniture, and pick up any branches and early fall leaves that have fallen. You can mow your grass a little shorter now, too. Aerate and fertilize for even better results. Fall is a great time to aerate and fertilize your lawn. Aeration will allow the fertilizer to penetrate deeper into the roots of the lawn, giving it much-needed nutrients over the long winter months. Your grass will be will be prepared to grow again stronger and lusher in the spring. Keep watering until moisture arrives. It’s tempting to stop watering your lawn once the cool weather sets in, but resist the urge! Your grass needs moisture, so until snows or rains begin, it’s good to keep watering it on schedule. Once the snow sets in, it will have the moisture it needs. Of course, you can skip all of these steps and simply call our Grand Rapids lawn care team to do the work for you! We offer great prices on lawn care so you can focus your time and energy on other activities while we take care of the lawn. We’ll make sure that your lawn and landscaping are fully prepared for the harsh Grand Rapids winter season and prepared to come back looking their best in the spring. Click on the button below to call our team to start lawn care services today!